While many folks obsess over which rye whiskey and which sweet vermouth make the most magical Manhattan, not enough attention is paid to the lowly cocktail cherry. I say “lowly” because, unfortunately, what passes for a cocktail cherry in the vast majority of bars around America is a pale imitation of its ancestral archetype. The modern American cocktail cherry is akin to an evil incarnation of all that is wrong with today’s overprocessed food world. Of course, in a truly great cocktail bar, you hopefully won’t find that neon-red, waxed-up and shiny Corvette-paint-job of a cherry that might belong on an ice cream sundae or even in a Shirley Temple, but definitely not in a Manhattan. 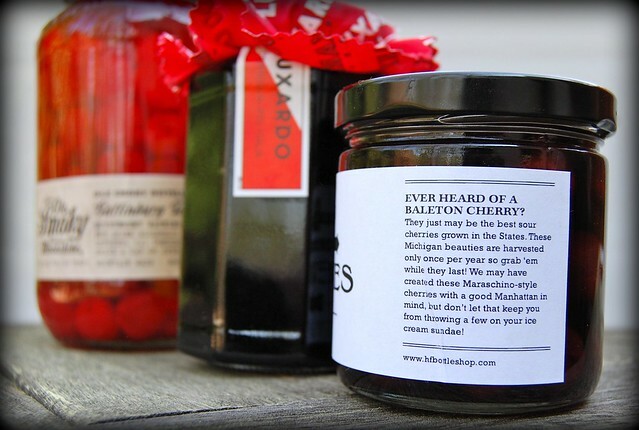 What you will likely find is either a housemade version or a jar of Luxardo Maraschino cherries. 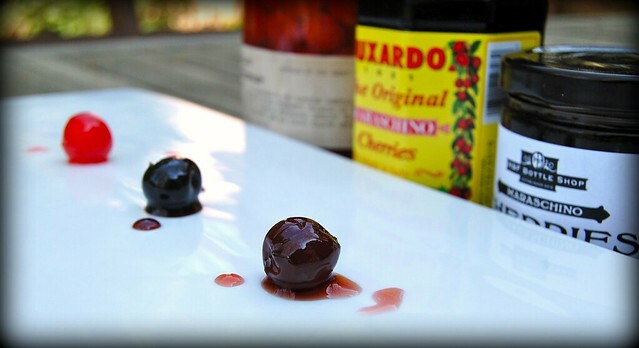 These Luxardo cherries are the real deal, from Italy, since 1821, made with real Marasca cherries, real Marasca cherry juice, real Maraschino liqueur. They are a deep black cherry red. They speak to reality rather than saccarine fantasy. I love cherries. I really do. Especially the ones you can buy on the side of the road in the heat of summer, in places where they actually grow cherry trees. There’s nothing quite like the joy of spitting out cherry seeds at sixty miles an hour as you cruise down a country highway – except maybe the joy of reaching the end of a good Manhattan and finding a perfectly delicious Maraschino cherry waiting for you at the bottom of the glass. In the name of cocktail science, I undertook a taste test of three different cherries – the classic Luxardo Maraschino, an American take on this classic by H&F Bottle Shop in Atlanta (but using Balaton cherries from Michigan), and a Southern-fried “moonshine” version from Ole Smoky Distillery in Tennessee. On to a modern rendition, from H&F Bottle Shop. (If it seems I have a penchant for this particular purveyor, it’s true – after all, who else is in the South is selling housemade cocktail cherries and Bloody Mary mix alongside a killer wine and spirits selection?) So, first, there are the Balaton cherries, which are “harvested once a year” in Michigan and “may be the best sour cherries grown in the States” (according to none other than H&F Bottle Shop!). Then, H&F uses a combination of cranberry juice, sugar, and Maraschino liqueur to pack the cherries and create a nice light syrup. The color here verges to a purple Kalamata olive territory, decidedly lighter than the Luxardos but still dark on the way to black. The syrup is relatively thin and tart, thanks to that cranberry juice. The taste is a little sour, a little sweet, and very natural, much closer to what you expect from a fresh cherry than something out of a factory. In a Manhattan, these deliver a balanced flavor that is tremendously complementary to the rye and vermouth. And the texture is not too soft, not too crisp, really just right. Big props to H&F for finding a way to better Luxardo, at least in my book. Pricey? Yes. Worth it? I think so, at least for a special treat every once in a while. 5oz for $16. What have we learned here? Well, first off, ditch that whole notion of cocktail cherries being “cherry red” and opt for something closer to midnight black. Grab some Luxardo if you can find them, call up H&F Bottle Shop if you’re eager for a more artisanal approach, or wait until summer and make up a batch of your own from fresh cherries. That is, if you can stop yourself from eating them first. Maraschino cherries are very good. Mixing them with moonshine – even better! Not everyone’s budget can afford to be as snobby as you seem to be. Luxardo’s may be the original, and in your opinion the best, but at $ 17.29 for a small jar (OUCH!) I don’t imagine they will ever outsell the shiny red ones! I don’t think they’ll ever outsell the shiny red ones, either! But sometimes a little indulgence is worth it, especially if it’s making its way into a carefully made cocktail. If you’re plopping them onto a sundae or into a Shirley Temple, that’s another story. Why not simply a fresh pitted black or red cherry for your cocktail? Buy a cherry/olive pitter, a cheap and useful device. I’ve tried the Luxardo cherries, and they are indeed worlds better than the standard maraschino cherries, but they’re absurdly overpriced. Not so their Maraschino liqueur, which isn’t what you may think it is: colorless, distilled from Marasca cherries, including, importantly, the pits, and having a taste between cherries and bitter almonds. My version of a Manhattan: 2½ oz. good Rye (I like Bulleit), ½ oz. DRY Vermouth, ½ oz. Maraschino liqueur, a dash of orange bitters. Shake with ice, strain into a chilled cocktail glass, and add a pitted fresh cherry. Pingback: The Manhattan Cooler: A summery version of a cocktail classic | can't we all relax and have a cocktail? Where can you buy the H&F cherries if you don’t live in Atlanta? I LOVE MANHATTANS! Bob, sorry for the slow reply – give H&F a call. I don’t think they sell outside Atlanta (but might ship). And they have changed their cherries since that batch I reviewed (not for the better, IMO). I was at the liquor store and saw ~6 different “Maraschino” cherry products to pick from. 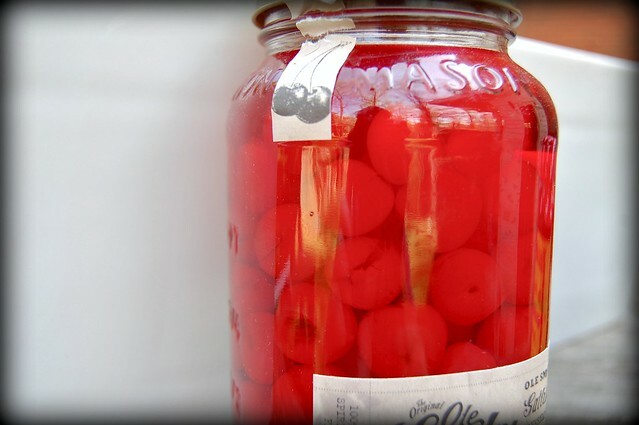 However, trying to strike a balance between price and quality, I ended up with a jar of Amarena cherries. I believe they were ~$10 for 8.8 oz. They’re nice dark cherries in a thick syrup. So far I have no complaints. Just got an order of Jack Rudy Cocktail cherries. Made in South Carolina from Oregon cherries in Kentucky bourbon. YES. About $18 for 16 oz. About as good as the Woodford Reserve Cocktail Cherries.